From outside the door: "Mary's Muffins is nothing without me! I'm the only reason you'll be giving out free samples on Saturday! If it weren't for me, your only customer would be Wilbur Weston! How do you plan to bake millions of muffins, and still have time to do all the marketing? Huh? How? Tell me that, baby. Now let me back in and we'll discuss roadside signage. Hello? Baby? ... Are you still there? Hello?" For those of you who think nothing ever happens in the Sunday strip, hold on to your skullcap because your mind is about to explode. First, Karen Moy googled "Self-Defense Quotes" to great results. Of course, Connor McGregor is a mixed martial arts champion (the term "art" being applied very liberally here). And as we're about to see, even gray-haired old ladies can learn a thing or two from watching Fight Network, for those times when they have to fight off hormone-infused turtleneck wearing septuagenarians. Oh no! What a horrible position to be in! Especially with her rheumatoid arthritis. But wait! After a well-earned slap, Ted Miller finds himself fighting against Mary's powerful mind control as she telekinetically pushes Ted to the floor. ...With a muffin on the top of his head! Ha ha ha ha ha! Sexual assualt is so funny! Ted ought to go into business with Dawn. She'll go out with anyone. As several have already pointed out, we should never forget that this strip is being written by someone who thought it was perfectly legitimate for an undergrad coed to go over to her male professor's house to practice yoga with him. I'd like to believe that that storyline was the tipping point for the #metoo movement. This is the second attempt since then to take an opposite viewpoint. But I demand at least 27 more stories about women being harassed before we forgive Karen Moy for Harlan Jones. I sometimes wonder if this is some elaborate plot of Jeff's, to help Mary appreciate the benefits of being off the market. I'm not that bright, so it is difficult for even this strip to insult my intelligence. But when it does, I tend to get a little worked up. Why in the world would a grocery store allow someone to do this? What's their cut? It's not like they're doing it for charity, like letting the Girl Scouts sell cookies out front. It isn't like they've contracted with a temp agency to provide minimum-wage workers to hand out a chip with some salsa on it to Costco shoppers. This is about undermining sales in their bakery department. And it makes no logical sense. Usually, I can make it to about June before I invoke my first logical fallacy penalty, but this year I'm calling it in early. Hey, here's something else they have in common! They both hold their expensive cell phones in that impossibly awkward and risky way. It's meant to be! Mary Worth is not a hugger. So's my neighbor's dog. That's why I don't go over there. Yes, Ted Miller is quite a character. It's his definining character trait. In panel one, it is clear that Mary is uncomfortable with Ted's lingering hug. In panel two, however, it's "boys will be boys." Plus, Mary looks like she's ready for a nap instead of a furious phone call to her boyfriend Dr. Jeff Cory, M.D. You mean this isn't a story about starting a muffin company? What a shock. "Okay. How much cash will I have to risk? How much cash will you be investing? What is your personal debt load? What is your personal credit rating? What is the level of success for new food products? What is the level of success for new food distribution companies? How many initial employees will we need to hire? What equipment will we need to purchase? Where will our production kitchen be located? Will we outsource our human resource department, or manage it in-house? Internet sales? Have you ever managed a company before? Have you ever started a company before? What licenses will be required to sell food to the public? These, of course, are just off the top of my head. I'll have hundreds of more questions when I call you. I'll talk to you later." Gee, Mary, maybe you could ask Google. But why don't you invest thousands of dollars and countless hours first. It really is the best way to find out. She's going to need a bigger oven. Boy, I wish someone like Ted had taken me aside and told me about the perils of fame before I started this blog. 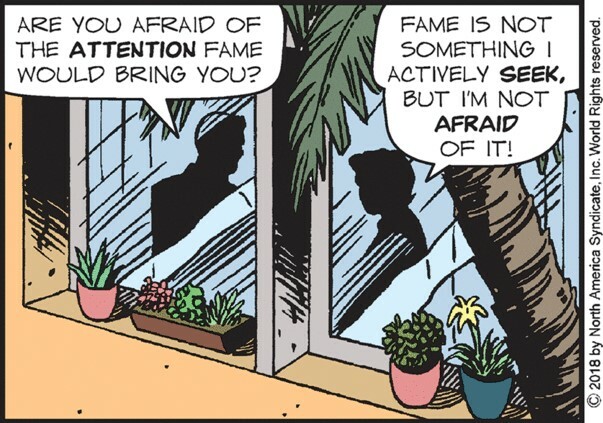 Fame is arguably the biggest burden of blogging about Mary Worth as you can imagine. People interrupting my dinner at restaurants to tell me how awesome I am, flirty emails from readers, constant telephone calls from the media... The real danger is that I let it go to my head. Fortunately, I'm so humble that I can handle it. "What am I really afraid of? Well, my tummy brain is telling me not to give you my money." Ted's door approach seems a little pushy. What was he selling in his former sales career? Magazines? The reason I ask is that back when Mrs. Wanders and I were first married, she was in our apartment when two guys in their late teens or twenties knocked on the door. When she answered, the bigger of the two guys explained that they were selling magazines. He asked, "Are you a model?" perhaps to interest her in a fashion magazine. Then he asked, "Is that your Porsche in the parking lot?" perhaps to interest her in an automotive magazine. She said she wasn't interested and they desperately explained that if they could sell just two more subscriptions, they'd earn a trip to Disney World, perhaps because they knew she wanted them to be that far away. She finally got rid of them and a few minutes later I came home. She told me about the encounter, and I went back in the hallway and found them on the floor below knocking on doors. I said, "Hey! What do you mean coming around here asking my wife if she's a model?" At that point, the little guy ran out of the building, and the bigger guy started to say something, but he only got four words in before I started walking toward him, "There is no soliciting in this building." He left, too. To this day, my wife cringes every time I ask her if she's a model, or it that's her Porsche in the driveway. Which I do a lot. "I've already made 12! If we sell them for $200,000 each, we'll be rich!" The money Paul Newman made selling salad dressing was attractive because he gave it all to charity, dimwit. Also, it wasn't just his money that was attractive. His steel blue eyes and smirky good looks made him box office gold even after his death in 2008. Putting Mary's face on the polypropylene wrapper of a moldering muffin isn't going to do much good in the world, no matter who draws her, or who profanes her name.